Has anyone seen this cereal box? When the friend I was visiting a few months ago said I could eat whatever I wanted in her kitchen, I took this to heart and ate half a box of her sister’s cereal. I tried the Shredded Wheat with Real Strawberries out of curiosity, and then found myself eating three bowls of it over the course of a day. I left about half a bowl’s worth of shredded wheat and freeze-dried strawberries in the box, just so I didn’t finish the whole thing off. When I got back home, I put the cereal on my grocery list, but after searching Kroger and Marsh, I cannot find this cereal! I began to wonder if it existed at all, or if I had remembered the name wrong. But there is nutritional information for it at The Daily Plate and a review of the cereal here, so it appears it was real even if it is not listed on the official Shredded Wheat web site. Does anyone know where I can find this cereal? Has it been discontinued, like Rainbow Brite cereal and other discontinued cereals? I have contacted Post cereal with my question, but I thought you guys might be able to help faster. Thanks! For me, a “splurge” isn’t a milkshake, but a piece of bread with my salad. It’s been this way for years for me, and while not technically overweight, I’m certainly not slender. I find managing my weight gets harder as I get older (I’m 43) and as I get closer to my “ideal” weight (I’m about 10 lbs over). Sigh. I suppose, as I get older and (I hope) closer to my “ideal” weight, it’ll just get harder and harder. I envy you, eating Nutella and baguettes and cereal and STILL losing weight. Grrr…that seems like the problem I had with it’s cereal twin: Shredded Wheat stuffed with pureed raisins. Most delicious thing in the world and I had it all the time as a kid, but when I remembered it and went looking for it a few years ago it seemed to have disappeared from store shelves. I did end up finding it in Australia when I was there (with it’s Aussie cousin, shredded wheat stuffed with currants) but that’s not really a viable long term solution seeing as how I live in the US. @Allison – Well that’s super embarrassing. I put apostrophes were no apostrophes should be and there is no edit button to hide my shame! I’m pretty sure I saw this at the supermarket over the weekend — it reminded me of the one they used to make with raisins inside, and I almost got it, but I was afraid I would eat the whole box. cereal is my favorite food, i will look tomorrow at the store for you. I’ve seen lots of cereals like that – I used to have a real thing for the Jordan’s one. It had sort of oaty clusters rather than the shredded wheat, though. Alternatively, you could try buying freeze-dried strawberries (I know you can get them at Julian Graves but I bet you don’t have those in the states) and adding them to your own shredded wheat? I’ve seen “just strawberries” brand dried strawberries at my small local health food store too, so if you can’t find the cereal that’s a good substitution. They would be good in yogurt too. I remember seeing controversy about a marketing ad for that cereal about a year ago. Although I love cereal, I don’t really like shredded wheat and have no clue if they still sell it or not. It may be a test cereal, too. Some cities are marked as tester cities and they constantly have new, weird, sometimes AWESOME things that disappear and then are sold everywhere else, but where they live. Portland Oregon is one such city…Good luck! You can put your name on the list at Amazon for when it comes available…. Looks good, but be careful. I got Honey Bunches of Oats with Strawberries a while back, and got a bowl full of mildewed strawberries. SO GROSS. Now I’m scared of any cereal with fruit in it! Mmmm, that looks goooood. I think we have a Special K with strawberries… something about the freeze dried strawberries! Of course, Australian Special K tastes different to American Special K, and the American is far superior. If it didn’t cost $13-15 a box to get it here, I would live on it. @victoria – What an awful way to live. You really need to see a nutritionist or a doctor, you should be able to splurge on things once and a while without gaining a lot of weight. Try Big Lots…they tend to have a lot of odd cereals and things that have been discontinued but that there was still significant stock of somewhere. You wear a size 10 everywhere (except Ann Taylor). I realize that everyone has a different definition of “thin,” but you are not in any way “fat.” I don’t know what your excercise habits are, so that may be an issue, but I really think the thing that most needs to lighten up is your attitude toward yourself. 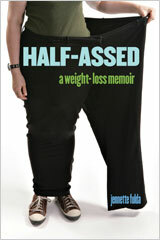 Of course it gets harder as your get closer to your “ideal” weight; your body needs fewer calories to maintain. Give yourself a break, please, and remember it’s all about averages over time, not the odd ice cream cone. I’ve been on a bit of a cereal kick lately… but just Kashi basic GoLean cereal. Only I added lots of fresh strawberries! I’ll take fresh over freeze dried ANY old day! So if you can’t find the cereal, just go get some strawberries to go with your regular Shredded Wheat and I bet that’ll be tasty too! Hopefully less addictive as well! And I ate the cereal you’re referring to for YEARS, and I’ll be darned if I can remember the name, lol. Raisin Squares, perhaps??? @victoria – This post screams eating disorder. I would recommend talking to your physician and/or therapist. A size ten at 5’7″ is pretty healthy and 10 lbs overweight in your forities is well within your BMI. This certainly gives me perspective that no matter what size you are you can still be unhappy with your self. @victoria – Ok, everybody. Let’s not gang up on victoria, all right? 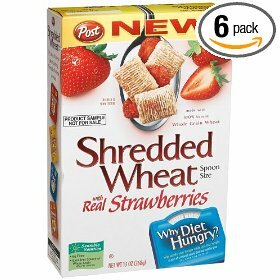 So, if can’t find the pre-made stuff, you could get the plain shredded wheat, and add the strawberries yourself. Wal-Mart. Of course I had to look for it and buy it. They also have blueberry, maple and some other something. I do like mini frosted wheats- so I’ll try strawberry. YUM. I am in SD though, but I can send some if you are really desperate! @Rhonda – Oh man, I hate Wal-Mart. It is alternately depressing and scary. But if they have the cereal…grrr! TJ’s sells the strawberries. Save yourself some pain and just buy them and add them to plain shredded wheat. @PastaQueen – I hope this doesn’t seem like ganging up, cause I don’t want to go against the queen, however I did want to insert a caution against using weight as a guide to ideal anything. I am a life insurance actuary, the profession that created those tables way back when, and they were created in a different health environment. It’s better to go by bodyfat. We know nothing about Victoria’s health level or lack thereof. I can’t assume you have an eating disorder–we don’t know what you look like. I personally have a very small frame, and the high end of a normal BMI looks very funny on me (too much weight). Some people look great with an overweight BMI. It’s individual. So, I wish you luck! Be careful! Cereal is a big problem for me weight wise. I LOVE the special K w/ strawberries myself. Can’t keep it in the house. But that said, if you have a Trader Joes near you, they sell packets of freeze dried (nothing bad in em) strawberries that you can throw into your cereal. Anything can be “w/ strawberries”. I have been in other Walmarts and I agree- I would be hesitant to step foot in most of them, but we are pretty lucky here. Ours is nice and clean. But mostly I try to patronize other stores, but the ‘ol Wal has the convenience of one stop for everything you could possibly imagine. I know- bad Rhonda! PastaQueen, bite the bullet and go to Wal-Mart. It has so many wonderful, inexpensive things it could become your favorite store. I feel the need to speak up in response to a statement in an earlier response post i.e. …..”this post screams eating disorder”…..
which I find so off-base and judgmental for this forum. .. or ANY forum for that matter. Based on that definition most everyone has an eating disorder, so I wish everyone online would just stop LABELING people in the misguided attempt to “Fix” them, and leave the diagnosis and verbal putdowns to those people who are physically close to ones who might need help. Thank you! I think you guys are right, I am obsessed with losing weight. You’re all right: I’m not overweight, I’m not unhealthily fat, and I DO have this “ideal” in my head that I’m trying to attain that may just not be reasonable for a woman my age! It’s funny how I didn’t see this on my own, but y’all are right. I think about food, exercise, and weight ALL THE TIME. I just came back from a two hour run. I had nothing to eat beforehand, and plan to eat not very much for the rest of the day . . . So, uh, yeah, maybe I do have a problem. I’m 43, definitely NOT your anorexic teen, and I don’t have a distorted body image — but my husband is super-fit, and I have this idea that he’ll love me more if I’m as fit as he is. And, in fact, he DOES like me better when I’m skinny & fit: he just commented that his marital satisfaction has improved dramatically since I made getting in shape a priority. I think obsessing about food, calories, and exercise is easier than addressing some other problems in my life. @victoria – Okay, then, wow. It does feel like there are a bunch of different issue intertwining. Being scared to eat carbs? Trying to run on not enough food? Dieting for years on end? I’ve lost about 23 pounds in the last 2.5 months, and I feel like I’m “so close” – 21% bodyfat and about 12 pounds from where I’d like to be – but the truth is that my body’s tired of losing weight. I’ve been “working on” fitness and health for a long time and I dropped pounds a few years ago and then decided to add muscle. Well, some fat came with it, and then a recession and job stress, and those 23 pounds, so I haven’t had that weight very long and it wasn’t too bad to drop them. But I started running and surprised myself by realizing I ran 9 miles in a row, so I want to train for a marathon or a half. It seems logical to stop dieting for a month or so, especially if I’m going to be converting my walking to running, so that my body isn’t on overload and has calories to build the new muscles and ligaments and whatever else it has to do. Again, I have no idea what you actually weigh or what your body looks like and skwigg is scary at 5’8″ and a size 4, and she’s 45-ish (see the link someone else posted). I don’t think anyone wants to discourage you from being healthy or fit or even looking great, but do it in a way that allows you some happiness too. Being scared of oat bran? Never eating dessert? 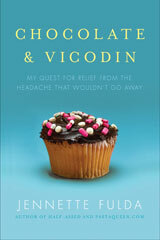 I do try to make desserts with splenda, so I’m not sure if you don’t believe in artificial sweeteners? Get em while they’re legal! You can’t beat Kashi cereal because it has lots of protein which keeps you full and tastes really good with fresh fruit! Hey PQ – I love this cereal too. And my DH happens to work for Post Cereal. Sadly it has been discontinued… :( So if you can find it somewhere else, get it! So now I’m back to Frosted Shredded wheat, or regular with real strawberries. @CK – Yeah, I emailed Post a few weeks ago and they told me the sad news. Oh well! I hear ya, but I’m on my last box of CEREAL, and I am on the hunt. I’ll buy TEN, just tell me where to buy them?! There was this crazy surplus store in Bum-F*CK PA, and I bought 7. Now I”m on the last box and have been looking since November. HELP HELP HELP HELP HELP HELP HELP!!! Oh! I miss Marsh! I wish we had those up here. I’ve seen that cereal in our local Walmart, but I never tried it. I hope you found it!